Why not grab yourself a copy of the animateTV dvd! Packed full of great work, it'll help you forget about how awful things are in the world! 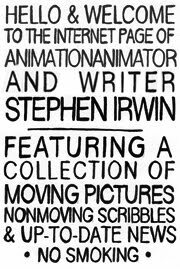 'Peddling a brand of animation notable for its dark humour and restless, relentless inventiveness. These 23 selected films are unashamedly artful, adult fare that implicitly call for a reappraisal of what the form is capable of… Highly recommended.' 5 stars.